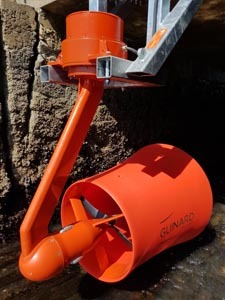 Guinard Energies designs and manufactures a range of high performance turbines dedicated to estuaries and very low head streams. Thanks to the swivelling duct, the Guinard Energies tidal turbines recover twice more power than other turbine of the same size. Moreover, turbine installation does not require heavy civil engineering. Due to their compactness, the hydrokinetic turbine could be set near the consumer location. Also, those hydrokinetic turbines are designed to produce electricity on-grid, in self-consumption mode or off-grid. The electrical system consists of one or more turbines, photovoltaic panels and storage batteries if needed. Guinard Energies offers support for your hydroelectric power project, from the preliminary study phase until the installation and maintenance of the electrical system.